We spent thousands of dollars advertising in the yellow pages -- and this was years ago when more people were still using the yellow pages to find products and services. A waste of money. We tried various types of direct mail to businesses, even to the point of creating customized pieces that had pictures of their current website with suggestions for improvement. This brought us a few customers, but in general, wasn't worth the expense. We didn't try newspaper ads or TV or radio commercials because we felt that our target client made up a VERY small percentage of those that would be reached by those methods, and the expense seemed high. Well, about six months ago, we had a breakthrough. You may have seen it around the valley. It's a billboard. It's eyecatching and has a very brief message that would attract those who've had a bad experience with a web developer and are ready to try again. Feedback from our clients told us that there were MANY who had previously had bad experiences with web developers, so that was a good point for us to key on. So a unique, fun, and very brief message on a billboard was the first half of the equation. The other half? A great website! You see, you can't say too much on a billboard. 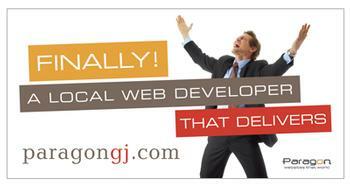 But you can get people to visit your website with a well-designed billboard. In order to capitalize on your investment, though, your website needs to be engaging enough and supply enough information so that visitors to the site will contact you. And here's the icing on the cake. If we had to put up a billboard that would stay in one place for 6 months, I wouldn't have even been interested enough to try it. I'd assume that most of those who were going to notice it would do so in the first few weeks, and the rest of the time it was up would be pretty much wasted. But Colorado West Outdoor Advertising has a GREAT offering. They'll move your billboard from one location to another each month, and they have billboards at some great locations throughout the Grand Valley. They're at 970-242-5248 if you'd like to check it out yourself. The bottom line if you're going to try this, though, is that you need a GREAT billboard design and a GREAT website.